Well booklovers, I meant to write about what I’d been reading this summer a long time ago, but somehow this autumn is flying by! In August, my list of books read was dominated by two authors: Hugh Howey and Gail Carriger (more on her later…). In a ruined and hostile landscape, in a future few have been unlucky enough to survive, a community exists in a giant underground silo. Inside, men and women live an enclosed life full of rules and regulations, of secrets and lies. To live, you must follow the rules. But some don’t. These are the dangerous ones; these are the people who dare to hope and dream, and who infect others with their optimism. Their punishment is simple and deadly. They are allowed outside. Jules is one of these people. She may well be the last. 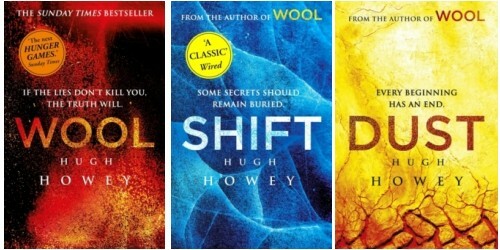 Like any good dystopia, it gave some moments of thought-provoking terror about the possibility of a world like this one coming to pass – especially in the second book of the trilogy, Shift. I’ll admit to being a bit confused when I started reading the first book, as I was under the impression that it was a YA series and was surprised to find the first few viewpoint characters with a wider range of ages, with nary a teen in sight. ‘My, how well-rounded with its characters this book is,’ I thought to myself, before a quick trip to google informed me that it was in fact classified as adult science fiction. I highly recommend this book, especially if you enjoy reading dystopias or sci-fi (near future).